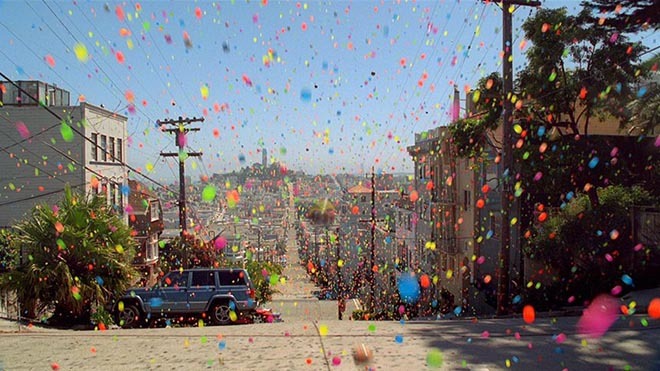 Sony had announced the arrival of the BRAVIA LCD and 3LCD range, with a short film featuring coloured bouncing balls (real time) bouncing down the streets of Russian Hill in San Francisco. The message conveyed? The colour we’ll see on these screens will be ‘like no other’. The Bravia advertisement takes a number of forms. The two and a half minute film will fill an entire advert break on its launch in the UK on November 6th, before the game between Manchester United and Chelsea. The ad is available to view online now at www.bravia-advert.com, where Sony offer photographs and film behind the scenes. 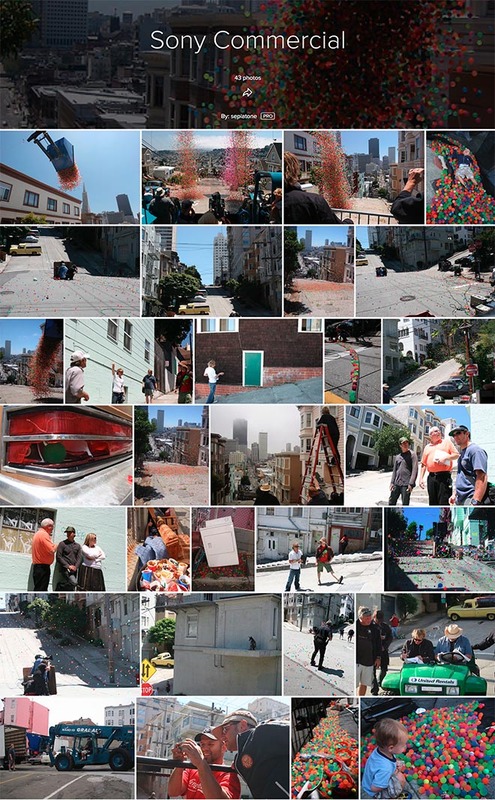 Photos from the shoot have been posted in an album, Sony Commercial, on Flickr. 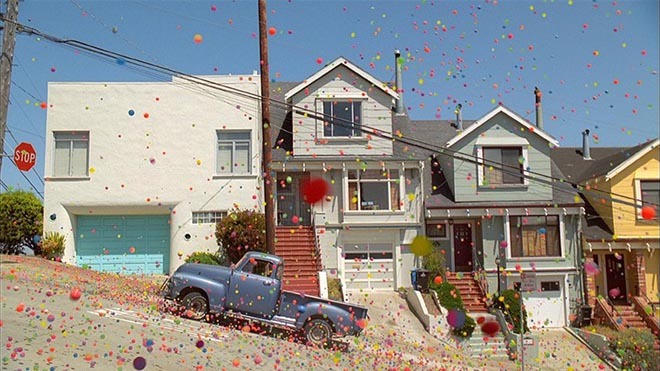 The Sony Bravia Balls commercial was developed at Fallon London by creative director Richard Flintham, copywriter/art director Juan Cabral and agency producer Nicky Barnes. 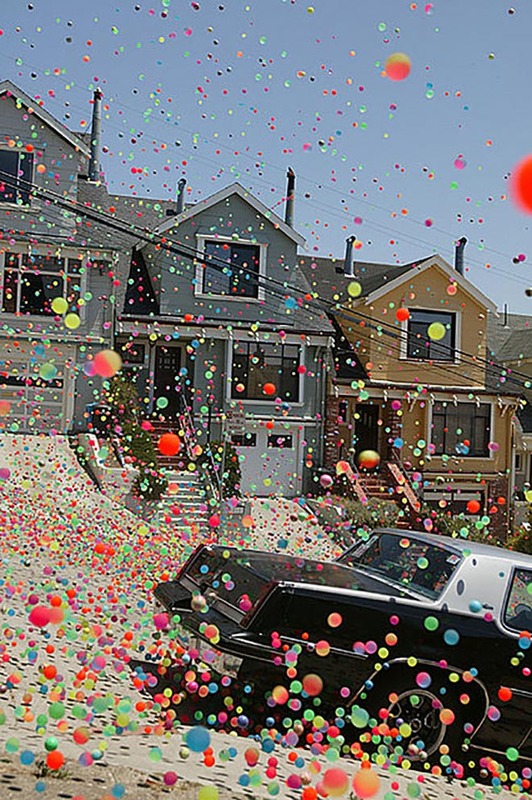 Filming for Sony Bravia Balls was directed by Nicolai Fuglsig via MJZ with producer Nellie Jordan, and director of photography Joaquin Baca-Asay. Editing was done by Russell Icke at The Whitehouse Post, London, with assistant editor Sam Gunn. Post production was done at The Mill, London, by VFX producers Darren O’ Kelly, Stephen Venning, Fi Kilroe, Jordi Bares, Robert Kolbeins, 2D artists Neil Davies, Adam Grint, Dave Birkhill, Judy Roberts, Rich Roberts, Zoe Cassey, Edwin So, Matthew (Wispy) Clarke, 3D artist Laurent Makowski and colourist Adam Scott. Sound production was done at Wave Studios, London. Music is provided by Swedish singer José González who will be touring the UK and Australia in November 2005. The song is called “Heartbeats” and features on the album, Veneer. As we’re told in the comments below, the original was sung by Swedish duo, The Knife and recorded on their album, Deep Cuts. Peacefrog will be releasing Jose Gonzalez’s version of ‘Heartbeats’ as a single and DVD on January 9, 2006 and can be pre-ordered now. The DVD includes Heartbeats in studio and live, a video documentary on Jose’s London concert, and ‘Colour Like No Other’. Download the Jose Gonzalez version of the track from iTunes. 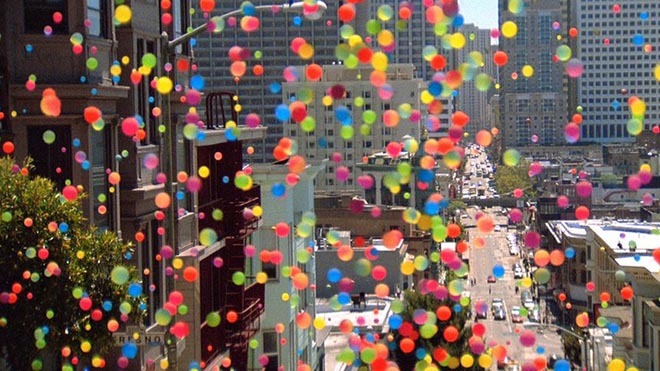 Check out the escalator installation featuring the Sony Bravia Balls footage. Advertising agency Viacom Outdoor worked with production company Tonic and post production company Rushes. 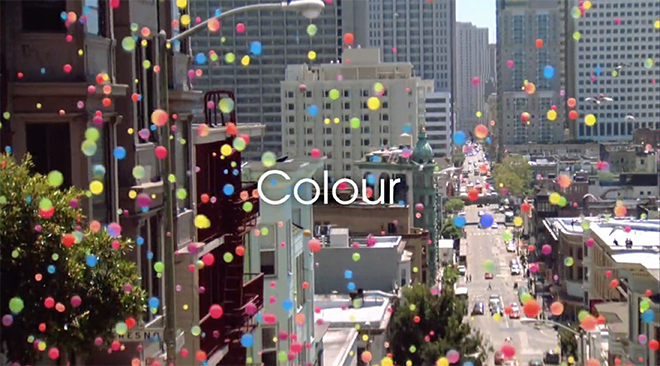 Sony Bravia ‘Balls’ won a Gold Lion in the Cannes Lions International Advertising Festival in June 2006, and Grand Prix at the Midsummer Awards in London, July 2006.